Many people tell me they can’t stand to workout an hour a day because its “too boring.” Mindless exercise is boring. Bringing your brain into the picture is a quick way to make training engaging instead of dull. If I’ve planned a 3000-yard swim, I can either get in the pool and plod out 120 mind-numbing lengths of the pool or I can pre-establish a workout with specific intervals and objectives to keep my mind engaged throughout. Occasionally, I’ll do a long swim so I can contemplate something going on with my life and try to come up with a solution, but I woud be bored to death if I just got in and used my brain for nothing more than counting lengths of the pool (kind of like singing 101 bottles of beer on the wall). Every time I get in the water, it is with some specific purpose. Maybe I want to achieve a certain time on a set of 100s. 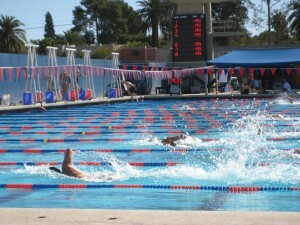 Or to negative split a set of 200s (swimming the second half faster than the first half). Or to step down a set of 3 500s (first one slow, second one a little faster, last one really hard). When I attend a Masters swimming workout, our coach sets up the workout for us and then I just mentally plan goal times for different parts of the workout. I also often think about one specific element of my swimming while swimming a set. Perhaps it might be getting a good pushoff on every turn, keeping my head lower when I do breaststroke or avoiding that crossover I sometimes get with my right arm on freestyle. The entire workout, my mind is engaged and there is a mind-body connection going on. When you just try to force the body do an activity in which the brain is in no way involved, you get boredom. I bet you’re wondering what I think about watching T.V., listening to iPods, and reading or listening to books on tape while exercising. My answer? That depends. If you want to do some long steady state exercise and aren’t concerned with “correct form,” it won’t hurt anything to do it some of the time. But I think its worthwhile to spend at least some time each week tuning into what is happening with your body. I advocate not “tuning out” while doing a sport such as swimming that requires a lot of skill. I also think its JUST PLAIN CRAZY to go out road biking with a headset on. While road biking, you should watch for objects and obstructions on the road in front of you and be alert to other drivers, cyclists and pedestrians. You can also track your speed, heart rate, and distance to make your ride more stimulating. 1 – instead of that same old 3 mile run (treadmill or outside)…. Put on a heart rate monitor and run 5 minutes to warm up and then finish the run with 2 minute easy intervals and 2 minute hard intervals. Make sure your heart rate doesn’t go higher than is safe for your age and cardiovascular health. 2 – instead of that same old X distance run outside….Put on a heart rate monitor and do random intervals. Warm up five minutes and then sprint until you get to the fire hydrant, the next corner or some other land-mark determined distance and then do a recovery jog in between each hard interval. This way you will get more engaged with your surroundings. 3 – instead of that same old boring 45 minute walk (treadmill or outside)…Go ahead and put the iPod on, but put songs of different tempos in sequence so you can walk to the beat of the music. Some songs will have you walking faster, others at a slower interval. 4 – instead of that same old boring 45 minute walk…Recruit a friend (or family members) to join you, walk your dog (or someone else’s), or go to a state or national park for a change of scenery. 5 – instead of a mile swim….400 yards (8 lengths) warm-up, including different strokes and drills you like and some kicking with a kick board. 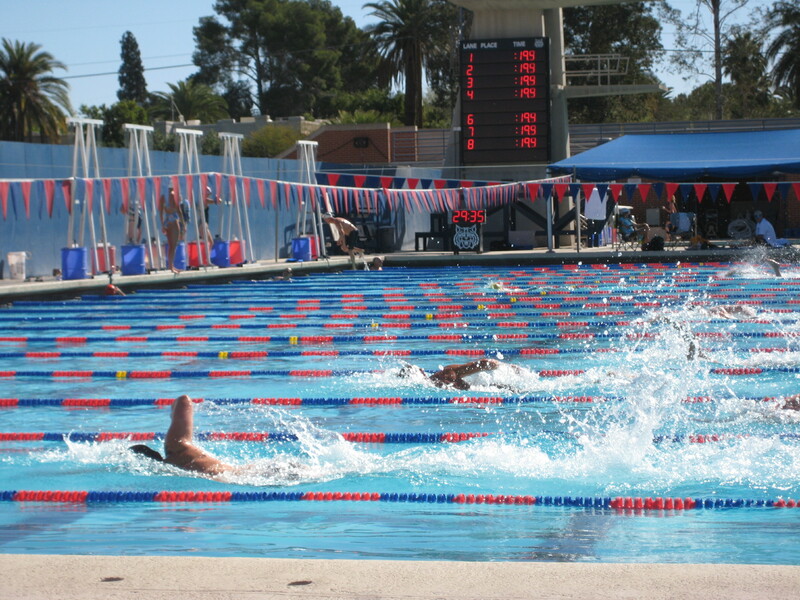 12 x 25s (1 distance per stroke, 1 fast turnover, 1 combine distance with speed x 4) 3 x 200s (negative split – second half faster than first) 6 x 50s (any stroke – step down 1-3, 4-6). 50-100 easy. 6 – instead of 45 minutes on a stationary bicycle….Buy or use a spin bike instead. Put songs on iPod that are good for hill climbs, sprints, and out-of-the seat jumps and jogs. Miix up the workout with a combination of these. Monitor heart rate and make sure to insert active recovery intervals. I’ve spoken to open water swimmers who say they rarely get bored while swimming for hours in the ocean. Why? Because there is too much to think about, they say. Keeping your mind engaged in every aspect of your activity can make workouts much more interesting. Have a fun and productive workout week. Now that I’ve shared my thoughts, I look forward to hearing about YOUR favorite ways to beat boredom in workouts! open h20 and mountain biking…keeps the brain active. Triathlon Training! In my 30 + years of “exercising” I have never enjoyed working out so much. Training for triathlons (whatever the distance may be) offers incredible cross training and use of almost avery muscle group we own. And when you reach that place of ” hitting the wall”, ie – I can’t do one more run on the river trail, or ride another 10 miles on this stinkin’ windy road, or do one more set of negative splits in the pool – there is always another run-bike-swim workout alternative. So many ways to mix it up. And the tri community is an awesome group, so encouraging for whatever level you are. Give it a tri! Patti, I agree that triathlon training is mentally stimulating and a lot of fun, especially when done with others. I had a great time on a recent XOOD racing team workout in Patagonia where we did a lake swim, a beautiful ride, and some of the tougher ones finished it with a run (I went back in the lake instead). Everyone shared ideas on technique and strategy, which gave the training session a lot of focus. I rely on my CD player when I’m on the treadmill. Sometimes I’m listening to a book, and zone into a steady state, and other times, I’ll have music playing, and then I’ll do intervals or switch between upping the incline or speeding up. If I forget my CD player, I’ll flip through a gossip magazine. Outside, though, it’s different. I don’t need my CD player (usually). There are flowers to see, unsteady ground to negotiate, cars to watch out for, birds to listen to–so much more sensory input that it isn’t boring. Jennifer, I like the variety of your routine. Varying works well for me, too. I’m glad you are enjoying the blog.